Former President Goodluck Ebele Jonathan was honored by the Southern Christian Leadership Conference in Atlanta, Georgia. He was awarded with the Presidential Award in recognition of his leadership in advancing human rights, social justice and the fight for universal freedom. The SCLC, founded by the late American Civil Right leader, Dr. Martin Luther King Jr, in January 1957 is currently led by Dr. Charles Steele Jr. The event is part of the activities leading up to the celebration of Dr. Martin Luther King Jr Day on Monday, January 18th, 2016. Former President Jonathan is the first African leader to be so honored. Dr. Jonathan also received Dr. Martin Luther King Jr's sister, Naomi King during the event. 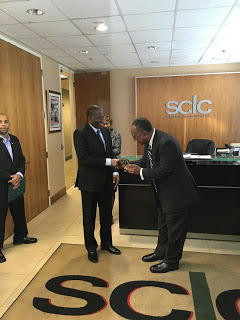 Before his remarks at the event, Dr. Jonathan met privately with the president of the SCLC. The president of the SCLC, Dr. Charles Steele Jr proposed to work with the Goodluck Jonathan Foundation to advance the cause of peace around the world and to bridge the gap between people of color in the Diaspora and Africa. Former President Jonathan responded that his vision is to help stabilize and promote democracy and peace in Africa. He went on to say that without peace you can not have economic progress. He revealed that this was the reason he pushed for Nigeria's intervention to ensure peace in various African nations such as Côte d'Ivoire while he was in office. Dr. Goodluck Jonathan and President Steele then agreed to collaborate along the lines suggested by the former Nigerian President. At the event, former President Jonathan expressed his gratitude to the SCLC for inviting him and declared that it was "virtually impossible to separate this worthy body from its founder, the late great Dr. Martin Luther King Jr, or from epoch making landmark events of the American Civil Rights movement". He also said "My personal takeaway from Dr. Martin Luther King Jr, is service to God and the brotherhood and equality of all men before their Creator. In keeping with that, I have learnt not to look up to any man, except he is taller than I, or to look down on a fellow mortal, except I am admiring his shoes". 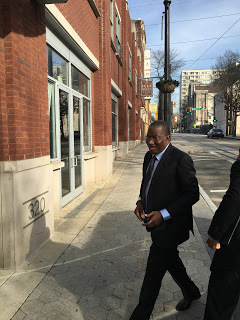 Former President Goodluck Jonathan is the Chairman of the Goodluck Jonathan Foundation and is in Atlanta, Georgia, on the invitation of a number of US institutions. Below are his full remarks at the Southern Christian Leadership Conference.